The Patriots are on a bit of a roll and have won three in a row. 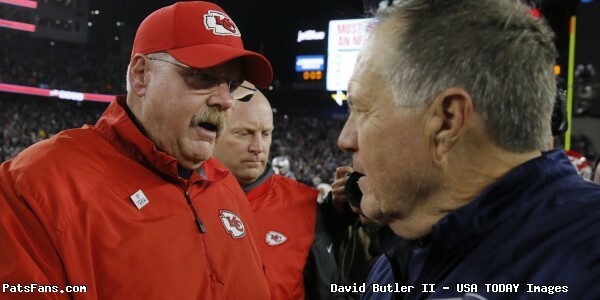 Last night’s win over the Chiefs won’t win many style points, but at the end of a scrap, it doesn’t really matter. The “W” is what was important especially coming in at 3-2 and the Chiefs undefeated. A loss would have put them far, far back in the standings, as early as it still is for the AFC’s top seed, instead, they’re right back in the mix of things once again. After a good first half, the defense at times got smoked by the fastest offensive unit in the NFL. The Patriots offense left some points on the board but still scored 43, which speaks volumes at the progress they’ve made on that side of the ball. Tom Brady knew that everyone was talking about Patrick Mahomes this week…and rightfully so. The second-year player but only starting his seventh game as a pro came in unbeaten and was lighting it up. Brady got off to a slow start this year but has been getting better. On Sunday night, Brady completed 24-35 for 340 yards and 1 TD. He also ran for a late touchdown on a short scramble that won’t confuse anyone with Tyreek Hill speed but was effective none-the-less. Brady was his vintage self, he had the offense in control and kept the Chiefs off balance all night. The Patriots rolled up 500 yards of offense and didn’t punt once. His only bad play was a poor decision to hold the ball far too long with no one open and was stripped sacked. Brady’s best pass was the touchdown to Edelman, on 3rd and 10, he dropped a dime in the corner of the end zone while under pressure. But late in the game, his deep passes to Chris Hogan and Rob Gronkowski were also beautifully thrown. While Mahomes impressed for the seventh straight game, Brady showed what he’s been doing for 18 years. The Patriots running backs had another very productive night. Sony Michel led the way on the ground with 24 carries for 106 yards and 2 scores. His ability to make those short-yardage conversions was very impressive. He hasn’t become a factor in the passing game…yet. James White is so reliable that when he has another game like Sunday night, you begin to take them for granted. White had six carries for 39 yards and five catches for 53 more. Six yards a carry, and over 10 a pop in the air. White and Michel have become a dynamic tandem that is just what the Patriots need. Kenjon Barner appeared for a series or two and chipped in with 3 carries for 16 yards as he is trying to assimilate in the offense. James Develin provided his usual hard nose in the blocking game and had a couple of pass receptions. The wide receivers were solid on Sunday night. Josh Gordon is still working thru some growing pains with Brady, their chemistry on the deeper out routes or the comebacks is still a work in progress. But he has very good hands, isn’t afraid to go over the middle to do dirty work and is still a big, fast athletic receiver. He made 5 catches for 42 yards but also drew a big 37-yard pass interference penalty on the one-yard line. 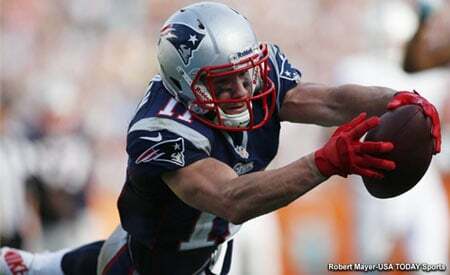 Julian Edelman had 4 catches for 54 yards including that nice touchdown pass from Brady. He had a solid game and chipped in one run as well for 7 yards. For a smaller WR, Edelman is an effective blocker in the running game. Chris Hogan has gotten a lot of negativity thrown his way lately. But on Sunday night, with a full complement of receivers on hand, Hogan was facing the 2nd and 3rd corners that he traditionally has gone up against. And he produced. Hogan was targeted just four times but caught all four for 78 yards. His big one was the 42-yard bomb from Brady where Hogan got separation and was being interfered with but still made the catch. Cordarrelle Patterson had one catch for 13 yards, one run for three yards and a 30-yard kickoff return. Phillip Dorsett was MIA, we had to check twice to ensure he was active. Rob Gronkowski was quiet most of the night, as the Chiefs, like other teams made it their focus to take him away. But in the fourth quarter, Gronkowski came up with two huge plays. A beautifully designed 42-yarder where Trent Brown shot out and blocked the corner on the line, allowing Gronk a free release. He then gave the safety a stiff arm that put him on his back. On the final drive of the game, Brady found Gronkowski down the right sideline for 39 yards, putting the Patriots in chip shot field goal range. His run blocking is outstanding and the big man was a key reason why they ran the ball down the Chiefs’ throats. Three catches, 97 yards, and his production came when they needed it. The offensive line was outstanding against an arguably depleted Chiefs front seven. But it doesn’t matter, you dance with the ones who brought you. They pushed the Chiefs back consistently in the running game. Brady was sacked twice but one was his own fault, holding the ball too long. Only 1 QB hit. The Patriots held the ball for 36 minutes and averaged over 8 yards per play and rolled up 500 yards of offense. The defensive line was able to bring some pressure in the first half but got no sacks. Although they did influence several throws, especially in the red zone where it could have resulted in touchdowns. In the second half, the pressure was down and they allowed Mahomes to break containment several times. Kareem Hunt gashed them again garnering 80 yards on just 10 carries. After a promising start, they faded down the stretch. This was a tale of two halves as well for the linebackers as their performance was up and down. The KC offense was targeting Dont’a Hightower early in the game with RPOs but then he picked up his game a notch and had several key plays. The interception of Mahomes where he put the Pats in prime position to score was a huge turning point. After showing blitz, he dropped and sat in coverage right in the throwing lane. At the end of the half, he had pressure on Mahomes and had a hold of his shirt where the hurried throw was picked off in the end zone by Duron Harmon. Kyle Van Noy had a couple of chances at big tackles for loss against Hunt but missed…which is hardly a surprise, Hunt makes a lot of people miss. Elandon Roberts had a couple of splash plays, a big run stuff near the goal line, and a deflected pass. An up and down night, but as we put in our keys to the game, the Chiefs offense is predicated on stressing the linebackers, which they do quite well. The secondary also was a mixed bag. The corners played a very solid game with one exception while the worst of the Chiefs’ production was the result of burning the safeties. Jason McCourty had a good game, the one play that was bad was where he had Hunt coming out of the backfield and peeked back at Mahomes in the pocket. Hunt kept going and was wide open. Mahomes hit him in stride for a too-easy 67-yard touchdown. Stephon Gilmore was excellent. He was locked up with Sammie Watkins and held him to two catches for 19 yards. He had a nice pass deflection in the end zone. Jonathan Jones got a freebie when Hill blew by him but the pass was overthrown. But he too was good. The safeties? Sunday night was a rough one. McCourty was victimized twice by Hill for touchdowns and Hill’s 75-yarder was the result of him blowing by Duron Harmon easily. The majority of the damage done by Hill was the result of the safeties breaking down. After a good first half, they had a disastrous final two quarters that nearly cost the Patriots the win. Stephen Gostkowski saves this grade from being much lower. He was outstanding kicking 5-5 on his field goal attempts. The game-winner, although a chip shot is still a pressure kick as we saw in the earlier games on Sunday afternoon. Ryan Allen had the night off except to hold and never punted. The coverage units allowed the Chiefs good field position consistently and then gave up a 97-yarder that put the Chiefs on the three and gave them the lead. Patterson had one decent return. The Patriots had an excellent game plan coming in and they executed it to near perfection in the first half, heading into intermission with a 24-9 lead. Bill Belichick had the team ready to go. The defense was aggressive and forced some errant throws by Mahomes early. The offense was clicking right from the start. When the Chiefs adjusted in the second half, we started to see the coverage breakdowns and big plays that they hoped to avoid. They nearly lost a game that they had much in hand at halftime. In the end, they made a few more plays than the Chiefs did and controlled the clock at the end to not give KC another shot. We’re on to Chicago. This entry was posted in 2018 Patriots Regular Season, NFL Commentary, NFL News, Patriots Commentary, Patriots News and tagged 2016 Patriots season, 2018 NFL Season, 2018 Patriots season, Andy Reid, Bill Belichick, Chris Hogan, Dont'a Hightower, James White, Julian Edelman, Kansas City Chiefs, Kareem Hunt, New England Patriots, NFL, Patrick Mahomes, Patriots, Patriots edge rushers, Rob Gronkowski, Tom Brady, Trey Flowers, Tyreek Hill on October 16, 2018 by Steve Balestrieri.